When most people probably think of theatre or live acting, they typically think of a very wealthy audience. However, this really was not the case back during the Elizabethan period. In fact, you would find an Elizabethan audience ranged from a lot of commoners to several of the wealthy people in attendance. Luckily, the pricing allowed for everyone who wanted to come to be able to come and see these wonderful performances that were written by great writers such as William Shakespeare. The pricing was not determined by who you were or what you did for a living. Nor did it always have to do with how close you were to the performers. Instead, it was primarily based upon how comfortable the seating was. Most of the commoners would pay only 1d to enter the theatre. This was typically a standing room only placement in the theatre. This area was commonly referred to as the “theatre pit”. Still, the commoners enjoyed watching the lengthy performances even though they were required to stand the entire time. As for the more wealthy, who would typically pay 5d to see the performance. The wealthy would generally have seating room and normally it was simple cushions that they would sit down on. It probably was not comfortable in comparison to today’s standards. To top it off, these were normally held during the middle or later evening before dusk. It could have been very warm or sometimes cold but this was a sacrifice made because there was very limited artificial lighting available at this point in history. 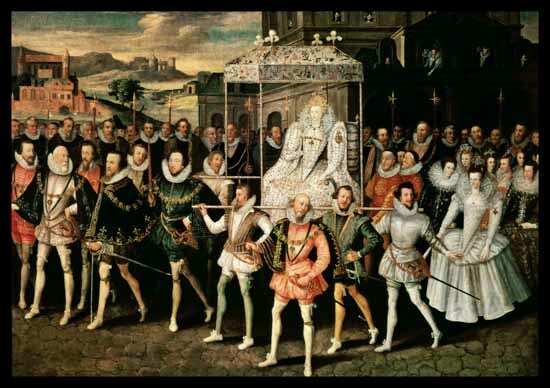 While many wealthy people did attend to see performances in amphitheatres, royalty such as Queen Elizabeth I likely never attended any of them here. Generally, she would likely have had private performances. It is likely that extended family or close people to Queen Elizabeth I would have been invited to these private performances held somewhere other than the local amphitheatre. Also, another notable thing you may have seen among the audience of an amphitheatre would be masks. Women who would be in the audiences during Elizabethan times often wore masks to cover their identity.